It is very well known that although Android comes with few limitations, it can still be a very powerful mobile OS with the help of third-party open-source apps… and K9 Mail brings that power to life. Developed by K-9 Dog Walkers, this app can be the best friend for anyone with multiple mail accounts and is in desperate need of an email manager. K9 Mail is a simple, no-fuss email client with functions integrated for perfect mail management. 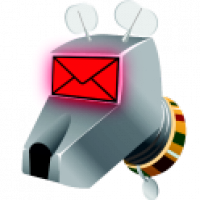 What K9 Mail really does is, sort multiple email accounts giving users the choice to either view all the account emails through the Integrated-Inbox, or just go through accounts one at a time. Users can also view how much storage space each mail account is taking. The User-Interface is very neat and non-cluttered, just the way an email client is deemed to be. Moreover, functionality is a walk-in-the-park. All you need is to swipe over an email and then have the option to Delete, Add Star, or mark the email as read. Also, on opening a particular mail, you can either reply, reply all (if there are more than one recipients), delete mail, and few other actions. K9 Mail supports IMAP, POP3 and Microsoft Exchange 2003 and 2007 servers. The app has various account settings to offer, which can be accessed by going to the homescreen of the app and long pressing the desired mailbox. Through this, users can empty the trash folder, open the mailbox, access the account settings (which include notification colors, check folders), time-frequency for syncing of email messages, and new email alerts. The app also allows the user to select his/her desired font sizes. Setting-up an Email account in K9 Mail is a breeze with no beating around the bush. A particular feature I found really helpful was notification colors against Email messages, helping the user to easily identify between read and unread messages. K9 Mail is a very straightforward app and hence there is very little to say about it. The app packs in a lot of punch as far as Email client management goes and does its job really well. So, everyone with an Android device and multiple mail accounts, this is your best bet to manage and keep emails sorted without breaking a sweat. Moreover, the app has around 32,000+ downloads with an average 4.5 star rating. Its worth a try.